Apparently, the past isn’t all that important. It’s all about the future, baby! At least, that’s what I took away from this week’s episode of Battlestar Galactica. For instance, Gaius Christ is helping his followers dismiss the past by convincing them that the twelve gods of the colonies that everybody’s been praying to for thousands of years never really existed. What’s more, worshiping the wrong god can lead to bad things happening — you know, like Cylons killing your entire family. (“And the correct answer was … Mooormon. Mormon. Everyone else goes to Hell. Sorry.” – South Park) But if you worship Baltar’s One True God, who as we learned last week loves you because you’re perfect, then all will be well. Be sure to grab yourself a complimentary cup of Kool-Aid on the way out, courtesy of God. Increasingly creepy Tory has mastered the art of Baltar-speak at this point, and uses it expertly to deflect Tyrol from questioning the exact nature of Callie’s death. “Maybe it was God’s will. We don’t know why these things happen. But God does. He has a plan for us.” She also seems to have bought into Baltar’s wonderful philosophy of complete non-accountability. “Whatever has gone before, whatever I have done, it doesn’t matter.” But while I half-believe that poor deluded Baltar preaches such a concept with some sincerity, I’m not so sure about Tory. You may not have noticed, but she kind of lies a lot. And this makes me wonder if she has an agenda that the rest of the Semi-Final Four aren’t aware of. In spite of Tory’s motivational speech, Tyrol decides that he can’t live with his past, and goes so far as to shave his head and put a gun to it. He must be working through the stages of grief, because he seems to miss Callie now, after hating the memory of her last week, and he’s pushing hard against his Cylon nature. 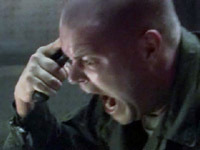 Regardless, his Private Pyle moment passes (Full Metal Jacket? anybody? ), he doesn’t kill himself, and Baltar visits him to say, “Blah blah blah, I was once a man of science. Blah blah blah, I have committed terrible crimes. Blah blah blah, fate and redemption. Blah blah blah, let’s hold hands and sing Kum Ba Yah.” And they do. And Baltar has another Cylon convert under his belt. Meanwhile, on the Demetrius, just as time is running out for Starbuck, she conveniently runs across Leobon, who is fleeing the recent Cylon Civil War massacre. He tells her that the Hybrid back on the Base Star also knows about Earth, and convinces Starbuck and Anders to jump to the site of the massacre to learn more. But when something goes wrong, Leobon starts working from last week’s script. Starbuck tenderizes his face and he begs for more, the way Tigh did as Six smacked him around. Then Leobon remembers which week it is, and tells Starbuck that her past life of drinking, frakking, and fighting are now irrelevant. “You have to make peace with your past. Because that part of you is gone.” She is now apparently “an angel, blazing with the light of God. An angel, eager to lead her people home.” So … she’s got that going for her. Unfortunately, what she does NOT have going for her is the support of her crew. Mutiny, anyone?